The Shanghai Museum is China's finest and one of the world's greatest museums. The ancient cultural masterpieces are superbly presented using state of the art lighting and display cases. The museum's collection has Chinese cultural treasures from prehistoric times through the Qing Dynasty (1644-1911). In addition, special exhibits featuring modern art are sometimes presented. The Shanghai Museum has ten permanent specialized galleries (bronze, calligraphy, ceramics, coins, furniture, jades, minority art, paintings, sculpture and seals) plus several special exhibition halls. This is the museum's most celebrated gallery. The bronze objects include ceremonial food and beverage vessels, musical instruments and armor. 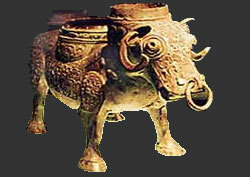 The 2,500 year old bronze wine warmer (see photo) in the form of an ox is a museum goers' favorite. It is highly praised by experts. Exquisite is the best word to describe this collection.